When Donald Trump accepted the Republican presidential nomination last night, his notoriety was among his first talking points. He has, he said, received nearly 14 million votes—the most GOP votes ever. That’s a lot of votes. It got me thinking: What’s up at Trump’s Second life headquarters, which, months ago, was rife with supporters? Second Life boasts a long history as a battleground for real-life political controversies. John Edwards and Barack Obama earned their own headquarters in the virtual world, where Second Life residents would post up with signs, buttons and Americuh ephemera. Even back before the 2004 national election, according to virtual worlds anthropologist Tom Boellstorff in his book Coming of Age in Second Life, residents proudly displayed yard signs for George W. Bush and John Kerry. Second Life’s users are down from its 1 million high around 2013, but politics are still a popular point of debate among residents. In April, Bernie Sanders’ unofficial Second Life headquarters was besieged by Trump supporters. Above Bernie’s signs and flags appeared an enormous poster of Trump, seemingly giving Sanders supporters the thumbs-up. Out of Trump’s head, fireworks boomed. Demons—literal demons—flooded the room, according to virtual worlds reporter Wagner James Au. On the day after Trump’s official nomination, this apparent passion was nowhere to be found in Second Life today. In the wake of the Republican National convention, which drew nearly 20,000 people this week, I thought, there ought to be something. And, on the back of a pickup truck, a poster of Trump’s face was aimed at the viewer: me, alone. I waited, and waited, and waited. Where are the Trump demon-spawns, I wondered? Where are his fans? Where is the trolling, the profanities, the spamming? Why isn’t anyone celebrating? Against a flagpole leaned a dummy avatar with short hair and tattooed biceps. He held a “TRUMP FOR PRESIDENT” sign nearby a crudely cut out graphic of the Liberty Bell. I approached to see whether he was a real person and, disappointed, sat in a lawn chair and waited around the fire. In the meantime, I reached out to the veteran who had left a public message there detailing his reasons for voting Trump. Health care costs, labor participation rates, “no borders,” and national debt were a few of the ones listed. Citing Clinton and establishment Republicans, he added that “If all these people who I cannot stand hate him, that only makes me love him more.” The manifesto was thorough and heartfelt. When contacted, he politely declined to comment. 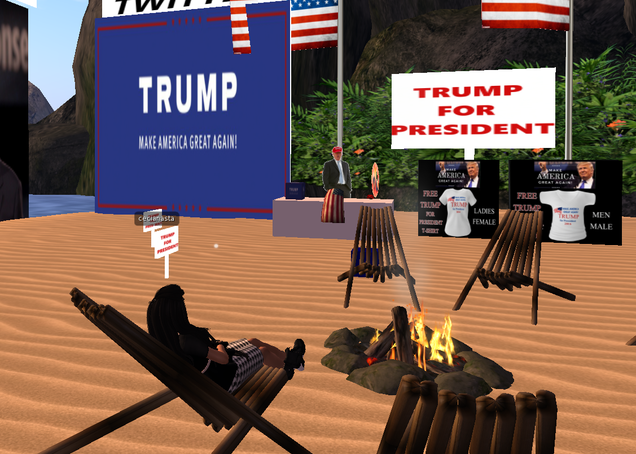 While waiting, I scanned the Second Life marketplace for Trump novelty items. Designers have crafted entire Trump avatars and masks for Second Life residents to wear. My favorite Trump-related item for sale, though, was a virtual kawaii Trump body pillow. “Make America Uguuu~~~~ again!” the ad reads. The body pillow’s designer told me that he has sold 109 so far. After a few hours, nobody showed. I left. I didn’t bother to go to Trump’s Second Life mansion, from which Kotaku reporter Mike Fahey was banned last April. Fittingly, it is private. I decided to hear over to Clinton’s unofficial headquarters. It was remarkably put-together. Flowers bordered the small house. Links to information about her were posted prominently. Red, white and blue star-shaped balloons floated nearby some set-up chairs, facing a podium. It was all quite respectable. But, like Trump’s unofficial headquarters, nobody was there.